If historical flasks are the king of bottles, then bitters are the queen. The term bitters comes from a type of medicine produced from roots and herbs, which typically had a bitter (disagreeable) taste. During the Temperance Act, bitters were used as alcoholic beverages under the guise of a medicine. 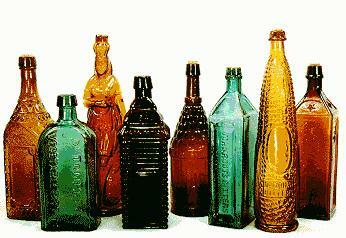 Unusual colors greatly increase the price of these bottles, as do figural shapes such as log cabin, pig, or ear of corn. 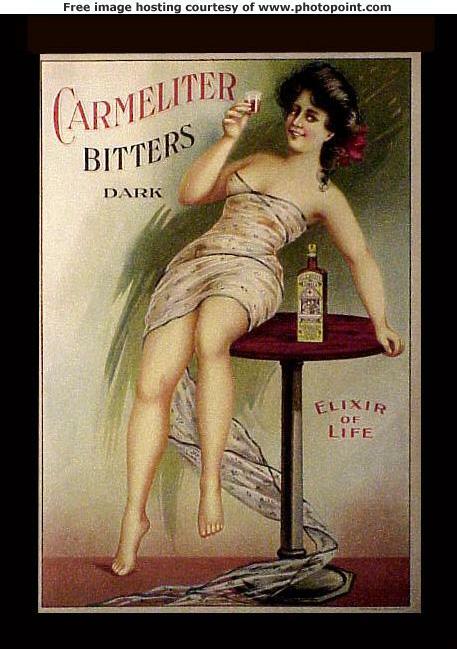 The advertising for bitters products was among some of the best of the times, and sometimes risque as in this 1901 ad for Carmeliter Bitters. Bitters Bottles book by Carlyn Ring and W.C. (Bill) Ham. Antique Western Bitters Bottle book by Jeff Wichmann. Many Bitters bottles are bought and sold online at ebay. Check the Collectibles:Bottles:Bitters category or search all ebay categories for Bitters Bottle. Glenn Poch's newsletter articles on Bitters and Asa Soule Hop Bitters.